Omnisphere again. Short ambient tune, that I thought it had a sort of Japanese feel, so It's named it after a park in Kobe. My son's idea - he's out in Japan at the moment, living near to Kobe. So when we go to visit him in July, I shall take an early morning stroll in Wakamatsu Park, with my iPod, and see how close I was! Well I've now been there! Not really very zen-like, as I had thought it might be, more of a concrete square in the midst of a shopping mall. But I did listen to the tune, standing beneath a lifesized statue of "Tetsujin", (Ironman 28; a famous Japanese manga superhero, 18 meters high), which is situated at one side of the square. This was the area of Kobe hardest hit by the earthquake which destroyed the city in 1995, and the statue was erected to commemorate this. Very Japanese and very cool! 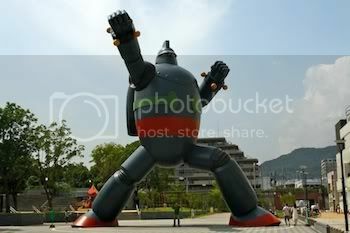 Here I am in Wakamatsu Park, standing beneath Tetsujin Go 28, listening to Wakamatsu Park on my iPod! Computer, keyboard and mouse, power lead, USB hub, a keyboard that looks like a piano, external HD, another power lead, USB cables [x2], speakers [x2] plus yet more power leads, [x2] cables to connect the speakers to the computer, [x2] and headphones [various] for mix testing. Hope I haven't forgotten anything. Hope your back gets better soon!! The piece is beautiful, tranquil, peaceful, Zen-like, meditational and immediately grabbed my attention. The pads are to die for as well as the bell/gong sounds. Omnisphere is a beast you seemed to have tamed somewhat. I'm still fighting it. The outro, with the double-speed instrument made the mix perfect for me. Hope you enjoy the trip in July. Very good...as usual! I particularly like the bass, both melody/sound. Is that Omnisphere too? And I feel your back-pain, experiencing similar condition myself at the moment. That bass is very nice indeed. Omnisphere must be a very nice toy to play with. Sounds great. Enjoy your trip and hope your back gets to feeling better. Omni Sphere all round good. Whatever it may be, you're making great soundscapes with it. D/L'd. Very soothing and peaceful tune with a real japanese feel. Maybe we could start a club! I'm just coming out of a bad back period too. As usual with your stuff, this sounds so rich and accessible. Yes, the melody line and the instrumentation does give it an oriental feel. It certainly does create a mood of serenity and relaxation. Beautifully done! This is a real nice piece ... calming. Great ambience to start my day. Creativity was not meant to be that kinda of painful... hope the back heals soon. Lush and a beauty. I am digging the Omnisphere. love the bassline underneath everything....really warm and enveloping. cool transition into the eastern sounds...and that bass line still ties everything together nicely. oh yeah...love that bass. reminds me of early ninjatune stuff. 2.32...nice sustain then fade on the string...although i was expecting a new departure here. minor nit....this is a really chilled trip. love the fade echo on the bells at the end. Cheers everyone. [This is in case anyone looks back] All your comments are very much appreciated. I'm with others who commented on the bass line and tone. Well done. But the eastern percussion instruments are what really do it for me. Many have almost a wind chime quality that give this the atmosphere of a stroll through an oriental garden. quite a lovely wash of sonic richness. Hi Dave. Hard to think you were in pain whilst producing this. It is so calming. The piece certainly evoked memories of my trip to Japan. Much enjoyed. Take care, Peter. Hi Dave - how did i miss this last week??? this film you put together is just FABULOUS, i watched on the full screen - wonderful! your ambient sound track is rich and deep and will be PERFECT to add to my "go to sleep music". those bells go straight to my heart! i hope your back gets better soon, thanks for this gift! I close my eyes and let the currents wash over and through me. This is sublime Dave. I hope that your own composition can perform some musical therapy on your poor back. Back injuries are so nasty since they show us how much of mobility we take for granted. Many thanks for the dload. Magical. Love it. You and the Omnisphere make a great pair. Enjoyed the kite show as well. Thank you for that. Arigatou gozaimasu - thanks very much. Relaxing vibe that does indeed have a Japanese tinge to it. I'm nicely mellowed out now - thanks! sound! And wonderful pictures.Love the dynamics. was so lulling. It kind of swept me off into a space within my own head -- something only the best ambient music does for me. Cheers! In agreement with most here, the bass is superb. Love the tone. Feels like it could be an intro to Death Cab for Cutie's, " I Will Possess Your Heart". If you haven't heard it I STRONGLY suggest listening to it, very similar to this track's mood. Well Done! Facebook that you are actually in Japan at the moment. Hope you are having a great time and that your back is feeling better. Amazing kites and gorgeous music. It does have some Japanese influences, nice mix & very relaxing/meditative....it'll be on replay thankyou !